The Tibial Tuberosity Advancement (TTA) is a procedure developed in Zurich, Switzerland in the early 2000s (1). The biomechanics behind its success for correcting cranial cruciate ligament-deficient stifles is a change in the patellar tendon angle that effectively neutralizes the tibiofemoral shear (tibial thrust) that occurs during weight bearing. 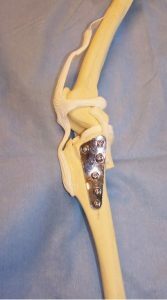 The surgical techniques contributing to its success include a significantly less invasive osteotomy and the lack of compromise to the weight bearing axis of the tibia. The procedure involves a cranial tibial crest osteotomy, advancement of the tibial crest with an advancement cage (acting as a stabilizing wedge) and internal fixation of the crest with a thin, tensionband plate held in place with bone screws (Figures 1 & 2). Pre-operative measurements are taken from lateral stifle radiographs (with joint extension) to determine appropriate basket and plate sizes. In our experience, the patient experience in the immediate post-operative period appears to be improved over other active and passive stabilization techniques such as TPLO and extracapsular lateral suture imbrication. Dogs appear to be more comfortable in the first few post-operative days, as evidenced by early, strong weight-bearing. The long-term outcome appears to be equivalent to the TPLO procedure, based on our experience and indirect comparison of published evidence. Patients return to weight bearing rapidly and regain muscle mass quickly. Implant complications are rare, presumably owing to the less invasive procedure. Major complications include: post-operative patella luxation, tibia fracture, implant loosening, and meniscal injury (if initial meniscectomy/ meniscal release was not performed). Minor complications include: incisional infection/inflammation, seroma, and wound dehiscence. The Tibial Plateau Leveling Osteotomy (TPLO) is a procedure developed in Eugene, Oregon in the early 1990s(2). 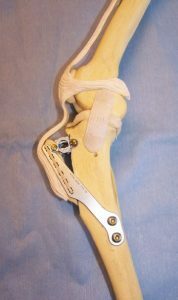 It was the first procedure developed to address the active biomechanics behind cranial cruciate ligament disease; the technique neutralizes tibial thrust during weight bearing by changing the tibial plateau to a neutral angle and effectively recruits the caudal cruciate ligament for primary stability of the stifle. The surgical procedure involves a radial (semi-circular) osteotomy of the proximal tibia, rotation of this proximal tibial segment and internal fixation with a bone plate and screws (Figures 3 & 4). Pre-operative measurements are taken from lateral stifle radiographs (with partial joint flexion) to determine saw blade and plate size, as well as degree of rotation required. In our experience, patients recover with better long-term results than traditional passive stabilization techniques, such as extracapsular lateral suture imbrication. By one month postoperatively, patients are strongly weight bearing and advancing in their at-home physical therapy. Implant complications, consisting of infections or screw loosening, are seen in small percent of cases and are managed with appropriate antibiotics and implant removal after healing. Major complications include: post-operative patella luxation, tibia fracture, implant loosening/failure, and implant-related infection, and meniscal injury (if initial meniscectomy/meniscal release was not performed). Minor complications include: incisional infection/inflammation, seroma, and wound dehiscence. The veterinary literature remains inconclusive regarding “the best” therapeutic option for the cranial cruciate deficient stifle; or, perhaps interpreted a different way, the literature supports multiple options. Two recently published literature reviews 3,4 were unable to clearly identify a superior surgical procedure due to variation in study-design and commonly subjective data comparisons. The principles of evidence-based medicine decision-making will undoubtedly be useful for answering this question as we collect more data in a prospective and standardized manner3. Until that conclusive moment arrives, decision-making must continue with available evidence. TTA and TPLO both appear to be excellent procedures for the treatment of cranial cruciate ligament injuries in medium and large breed dogs. These procedures may also be considered in smaller, more active patients and those patients with bilateral disease. They should be considered for those patients in whom other procedures have failed. As an example of how we facilitate this decision for clients and patients who present to our practice, we recommend TTA as our procedure of choice for most of these cases due to the more rapid ability to bear weight, a lower complication rate, a less painful convalescence, and high owner satisfaction. We have been performing the TTA successfully for four years now. Our experience with the approximately 800 cases we have managed has been positive and similar to the early reports in the veterinary literature5. We highly recommend this procedure for medium to giant breed dogs with cranial cruciate ligament disease and for any size patient who needs a rapid return to athletic condition. Some dogs are not good TTA candidates due to an excessively steep tibial plateau angle, a coexisting patellar luxation, or excessive concavity to the tibial crest. In these cases, TPLO is an excellent alternative. We have been performing the TPLO successfully for 11 years now. Our experience with over 10,000 cases has been positive and similar to the clinical reviews in the veterinary literature6,7. We recommend this procedure for large to giant breed dogs with cranial cruciate ligament disease and for those patients who need to return to an athletic lifestyle. Many factors enter into the decision-making process that revolves around a recommendation for medical care. Everything from patient compliance to client financial concerns to the availability of surgical equipment and expertise will impact how a case moves forward. The interpretation of sound scientific data will help us, but it will also only be a piece of this complex puzzle. It is at times frustrating for all involved to navigate these decisions; acknowledge these frustrations through open communication and keep working toward the best treatment option for each patient and owner. References 1 PM Montavon, DM Damur, S Tepic. Advancement of the tibial tuberosity for the treatment of cranial cruciate deficient canine stifle. Proceedings of the 1st World Orthopaedic Veterinary Congress; Munich Germany, September 2002, p. 152. 2 B Slocum, TD Slocum. Tibial plateau leveling osteotomy for repair of cranial cruciate ligament rupture in the canine. Vet Clin North Am Small Anim Pract (1993) 23:777–795. 3. SE Kim et al. Tibial Osteotomies for Cranial Cruciate Ligament Insufficiency in Dogs. Vet Surg (2008) 37:111–125. 4. CL Aragon, SC Budsberg. Applications of Evidence-Based Medicine: Cranial Cruciate Ligament Injury Repair in the Dog. Vet Surg (2005) 34:93–98. 5. J Cook. Outcomes-Based Patient Care in Veterinary Surgery:What Is An Outcome Measure? Vet Surg (2007) 36:187–189. 6. S LaFaver et al. Tibial Tuberosity Advancement for Stabilization of the Canine Cranial Cruciate Ligament-Deficient Stifle Joint: Surgical Technique, Early Results, and Complications in 101 Dogs. Vet Surg (2007) 36:573–586. 7. NH Priddy et al. Complications with and owner assessment of the outcome of tibial plateau leveling osteotomy for treatment of cranial cruciate ligament rupture in dogs: 193 cases (1997– 2001). J Am Vet Med Assoc (2003) 222:1726–1732.